Simple meals are sometime the trickiest to create. Many a days all you are left with is limited pantry staples. That for me would be canned chickpeas, herbs, dried pasta, potatoes, ginger, garlic, onion and tomatoes. Either one of these said ingredients needs to be replenished, in order for me to make the run to the supermarket. These days my run to the supermarket is slightly different, I mostly visit the Fruits and Vegetable Market. It gives me immense pleasure to get the fresh produce straight from the market, not your fancy farmer’s market setup but very economical. I have made some friends with a few stall owners who provide me with their freshest produce of the day. One stall owner Mehran whom we visit for buying greens and herbs, keeps stock of basil and spinach handy for me. He knows I visit Saturdays. I have successfully been able to slash my grocery budget substantially. 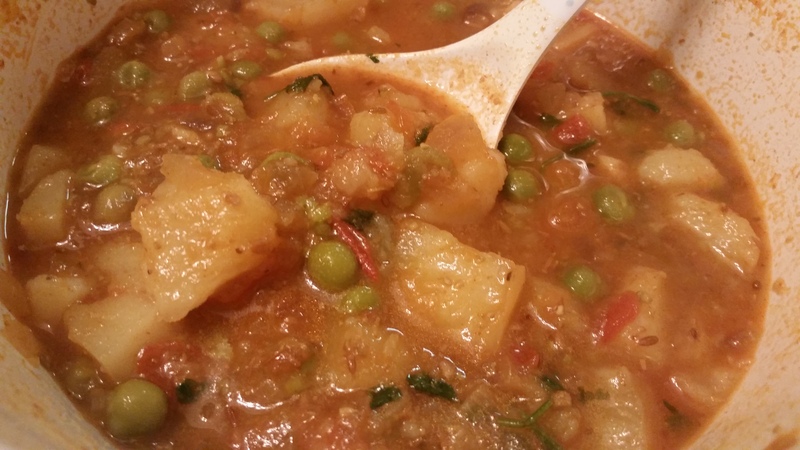 Moving on to the recipe of home style Aloo Mutter served with Jeera Rice and yogurt. In a pressure cooker, heat some oil, add cumin seeds. Let it splutter, add carom seeds followed by onions. Once cooked, add minced ginger and garlic and tomatoes, cook them well. Add dry spices, salt and then the potatoes to the mix. Blend well, add water as required. Close the lid and pressure cook until there are 2-3 whistles. Uncover after a while and garnish with some freshly chopped coriander. 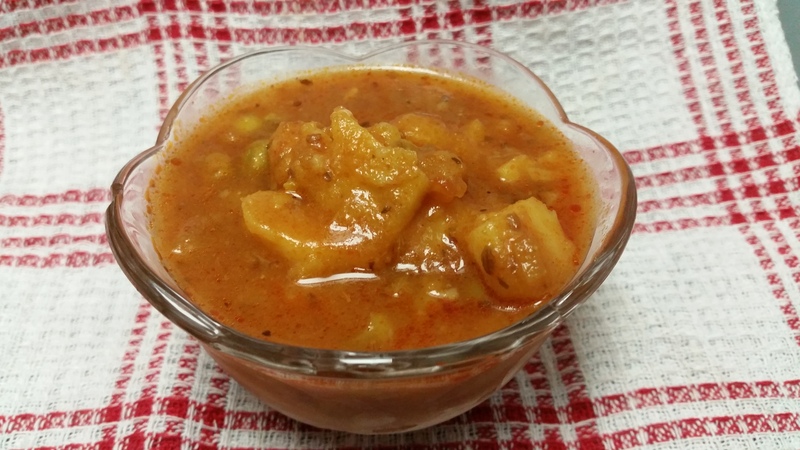 Serve with fluffy rotis or Jeera Rice. Until next time happy cooking!